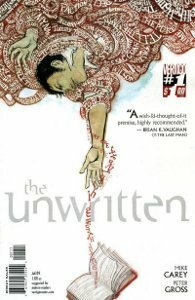 The Unwritten, by Mike Carey and Peter Gross. Recommended for mature readers. Published by Vertigo Comics. The Unwritten is a story about stories, and the impact fiction has on reality. It’s told as an adventure, filtered through today’s media-crazed society, modern fantasy (especially the Harry Potter phenomenon), occasional moments of horror, and centuries of popular literature. It was also my favorite new comic book of 2009. Years ago, author Wilson Taylor vanished after writing 13 immensely popular children’s fantasy novels, leaving his son Tom — the real-life inspiration for “Tommy Taylor” — to grow up as a Z-list celebrity. A question at a fan convention sets the adult Tom onto a path of adventure and danger that has him doubting even his own past, as the world begins to wonder: Did Tom Taylor inspire Tommy Taylor? Or is he Tommy Taylor made real? By the time of the third major arc, Tom has been proclaimed a messiah, framed for murder, and declared dead. He’s acquired a power trio much like the heroes in his father’s novels (naturally, in the Harry/Hermione/Ron mold), with one ally who may be a fictional character brought to life, and one who plays the sleazy reporter but has his own connections. They’re on the run from a secret cabal, its hit man who can transform objects (and people) into their component ideas…and the surprisingly real vampire nemesis from the Tommy Taylor books, Count Ambrosio. Although Tom is just now figuring out his role in events, the villains have been pulling strings for centuries. They’ve shaped the world through stories: by controlling how history was recorded, and by ensuring that stories were written that promoted their goals. One early issue flashed back from the present to Rudyard Kipling, who was quite happy to write stories for them promoting the British Empire…until they asked him to change his tune, and he lost everything. Of course, since this is a fantasy series, stories can also impact reality directly. Magical objects cross into reality, people travel into stories, and in one case, a particularly tormented story actively threatens the heroes. Every few issues, the focus moves away from Tom Taylor to reveal another piece of the puzzle. One focuses on two children caught up in Tommy Taylor fandom to the point where they aren’t quite sure where playing ends and believing begins. 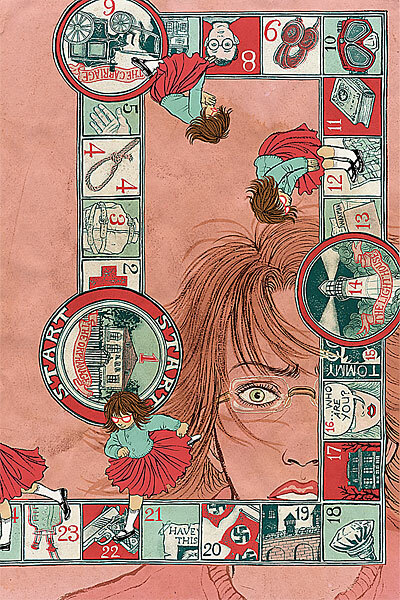 Another focuses on a servant of the cabal trapped inside a Winnie the Pooh–like setting by a writer who was prepared to stop him. The latest issue reveals the past of Tom’s ally and guide, Lizzie Hexam…in a choose-your-own-adventure format. She always ends up in the same place, but the path she takes varies…along with the most important parts of her back story. They’re all equally canonical, and you as the reader get to choose which version is “real.” In a sense, we do that with everything we read or watch. We have our favorite versions of stories, TV episodes and comic book issues that “don’t count,” and our own ideas of what’s going on off-screen or between panels. The Unwritten is up to 17 issues so far, collected in two trade paperbacks with a third on the way. Carey and Gross have a complete story in mind, one that they hope to tell over 60 or 70 issues. Update 2015: The series is complete now, collected in 11 volumes of the main story and a related graphic novel, Tommy Taylor and the Ship that Sank Twice. Interested in reading more? Good! I’ve written about a more traditional super-hero comic, Astro City, at Speed Force. And there are more bloggers out there. Check out the lesser-known titles reviewed in these other blogs and read these, too! This entry was posted in Comics, Highlights, Reviews and tagged The Unwritten on September 29, 2010 by Kelson. The way you describe it, this is so much down my alley that it’s almost criminal that I haven’t picked it up yet. I am tradebound! I’ve heard heaps of positive word on this series but now after that writeup I actually get what the books about. God bless Vertigo. Wow! That book sounds so fascinating! I’d never even heard of it until your review today. I’m e-mailing my local comic shop and ordering volume 1 right now! That just goes to show how successful the “Read This Too” crossover can be! Besides the great sounding story, I’m interested in Mike Carey’s work. He was scheduled to launch a Firestorm series in 2003, but DC pulled the plug. He and I wrote a couple messages back and forth recently about the Firestorm book and he was extremely kind. This one sounds really interesting! I need to look into it for sure.